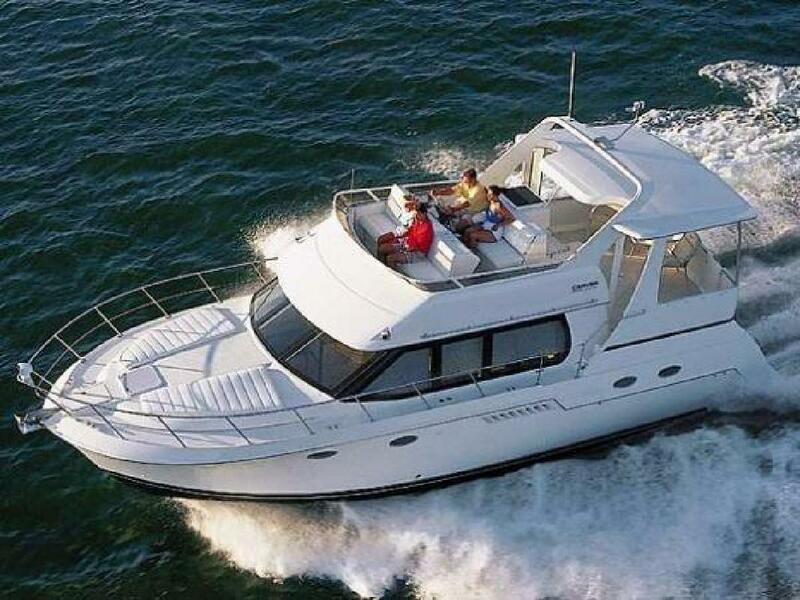 (LOCATION: Jacksonville FL) This Carver 406 ACMY provides size, style, and comfort in a relatively compact motor yacht. She features a large flybridge, aft deck, large open salon, and two staterooms to insure room, comfort, and convenience. On deck we start at the top with an open flybridge with radar arch and bimini top. Seating consists of captain chair and companion seating at the helm with guest lounge forward of the helm station. Twin stairways lead below to the spacious aft deck with hardtop and full enclosure. Casual seating provides a place to relax, enjoy a beverage and a beautiful day on the water. A wet bar with ice maker will help keep guests refreshed. The transom door opens to a stairway down to the swim platform. Wing doors open to side decks that lead forward to a foredeck with sun pad and bow pulpit with anchor and windlass. A companionway leads into the salon. The carpeted salon is large and open. As you enter the salon you find a leather L-shaped settee with built-in recliners to port. Starboard is an entertainment center and easy chair. The galley is forward and down to starboard and features upper & lower cabinets, a full-sized refrigerator/freezer, three-burner range with oven, microwave oven, coffee maker, and Corian countertop with integrated sink. Opposite the galley is a convertible dinette with seating for four. There are two staterooms. The forward guest stateroom features an offset double berth with upholstered bulkheads, bedside bureau, hanging locker, and guest head. The guest head has mirrored vanity and shower. The master aft cabin has island berth with cedar-lined hanging lockers, TV/VCR, and en suite head with mirrored vanity, and shower stall. Powered by twin Mercruiser 380-hp engines this beauty is designed for long-lasting dependable performance. Mechanical features include: generator, 3-zone reverse cycle HVAC, electric water heater, central vacuum, and Halon fire protection. Call now for more information and to schedule a showing of this Carver 406 Aft Cabin Motor Yacht.